It was as if the darkness swallowed me in, and forced me to be immersed in what was about to come. The walls and floor were painted dark grey if not black and it had markings and notes like a production set. I felt as if I was prepared to see a show and yet the chairs were not arranged in rows and the speakers are found almost in disarray everywhere. While the stage was seemingly chaotic, at the center of the room is this machine like structure that was in constant thumping and pumping like a beating heart at the center of the room. Despite the machine being a rigid structure, it was as if it was in itself a breathing and beating organic thing. There was a moment of stillness a few seconds before the installation video begins and in the darkness and stillness of the room, it suddenly flashed a bright video of a metronome that gave a constant beat. Even before my eyes could fixate on it, another flash of video of the same metronome started on the sides, and then another, until I was surrounded on all four sides by the ticking metronomes coupled with throngs of oppressive brass music aggressively pushing me deep within its center. I almost felt shocked and unexplainably scared and the lack of order in the seating forced me to go around the space with each of the speakers providing me individually with different music or audio throughout the entire experience. The metronomes proceeded to change into a video of a man walking constantly even up and down a chair that obstructed his path and the changes in each sides happened like a form of reaction from the first screen where it first showed the man. It constantly kept changing but each scene was almost felt like a reaction to the screen next to it and before the viewer can see what was happening to the other screen, the video had elapsed and had changed its context almost as if it was whirring the viewers gaze constantly like a centrifugal force and the only constant thing was the churning breathing machine in the center. There were instances when the whole screen was showing the same video and the next would be “different” possibilities of what could stem from that scenario as the case in the scene of a man leaving his wife at home to go to work and the wife taking her lover in the house the moment the husband leaves. The screens started with the same scenario and then proceeded to change in what happens next, in one screen, the husband suddenly comes home and the lover was made to hide under a table cloth. When the husband investigates, the lover changes to a tuba or in another video in another wall the lover hides under the table and a group of people instead comes out from under the table. There were multiple times when the videos kept repeating a scene like a disturbing video glitch almost like a hiccup in time. The screens while almost entirely different seem to have a central theme like different gears churning and working against and with each other. 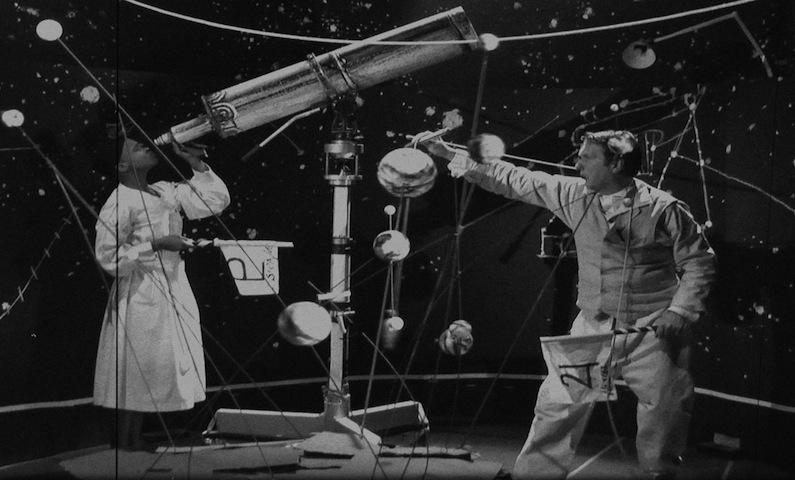 William Kentridge’s Refusal of Time was inspired by Peter Galison’s work when he studied a 1905 paper on relativity that hypothesized that time is not absolute and cannot be measured therefore there would be delays in any centralized and synchronized clock. This was made evident in Kentridge’s work with the delays in the changing of his videos that it felt as if each video was a reaction from its predecessor. The entirety of the show made me lose all form of control from the lack of central visual, the various audio that was playing in different speakers, to the lack of a constant position in which you’re forced to view the entire program in continuous motion. You are bombarded with the notion that you’re not in any form of control of what is happening much like a reminder of the conjecture that time, like the installation experience, is something that you cannot control.